Those 4 girls turned Pinterest upside down and inside out. This isn't your typical "how to form a post" - been there DONE that show... THIS is the "hidden treasures you pay marketers BIG bucks to do for you" show. Visuals matter on Pinterest more than any other social media platform, so make sure that you are not wasting your good content with a horrible stock image. Efficiency and consistency with Pinterest will increase your visibility and will help create a foundation of trust with your followers. You'll want to stick around for the whole show because Danielle Miller drops a major tip that is unknown to many Pinterest users. Get a leg up on your competition, provide better quality content to your followers and watch your business sky rocket with these Pinterest tips. A lot of non-typical Pinerest ground was covered. Most shows cover how to create your account and boards, effectively craft your images. 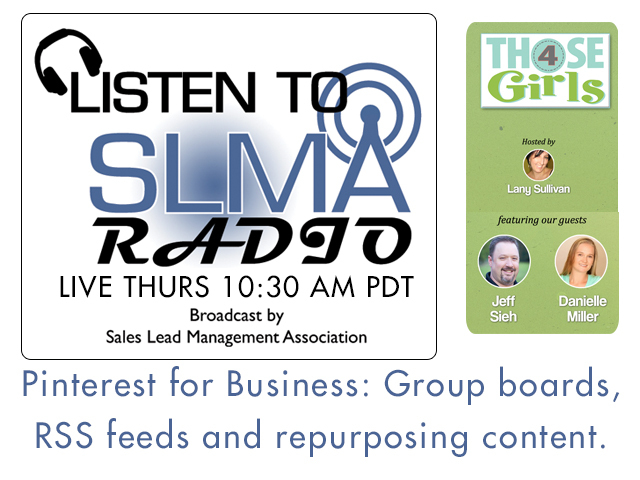 This show went deeper for business into the value of group boards, vetting them and inviting others to contribute. They also covered the HUGE hidden value of the RSS feeds created with each Pinterest account and pin board. This is a huge value if you are looking to maximize the reach of your well-written pins and blog posts. Danielle and Jeff reminded us to take the time to create or select a great image rather than relying on the typical stock photos of people in suits having a tug-o-war, or with all of their hands in a circle for teamwork. Be compelling with your images. SPEND THE MONEY or TAKE YOUR OWN photos to enhance. Co-Host, Susan Finch and Danielle Miller covered a valuable tool for distributing content: IFTTT.com - If This, Then That to maximize the RSS feeds created by your company in venues such as Pinterst and your website. Meet Our Panel This Week! Jeff Sieh - Founder and Host of Manly Pinterest Tips on YouTube. Each week Jeff is teaching us that men can pin too!